Five years ago, whilst on holiday in Japan, I took a detour. It started with a trip to Nakano Broadway – one of Tokyo’s main otaku destinations – a multi-level mall devoted to selling everything from manga to aidoru-related collectables, via video games and BluRay discs. It’s also home to Jack Road, which, it turns out, is actually a pretty good place to look for a vintage watch – even if the prices can tend to the steeper end of the scale. From here, I joined Hodinkee’s Ben Clymer in search of a small shop called Studio Tom’s a few miles away in Shimokitazawa. We had a local guide / fixer, but even with directions from ever-courteous locals and a Japanese policemen, Tokyo’s notorious planning system had us stumped. Then, after about three hours of relatively aimless wandering, we discovered the shop, tucked away in a back street a few yards from the railway tracks. 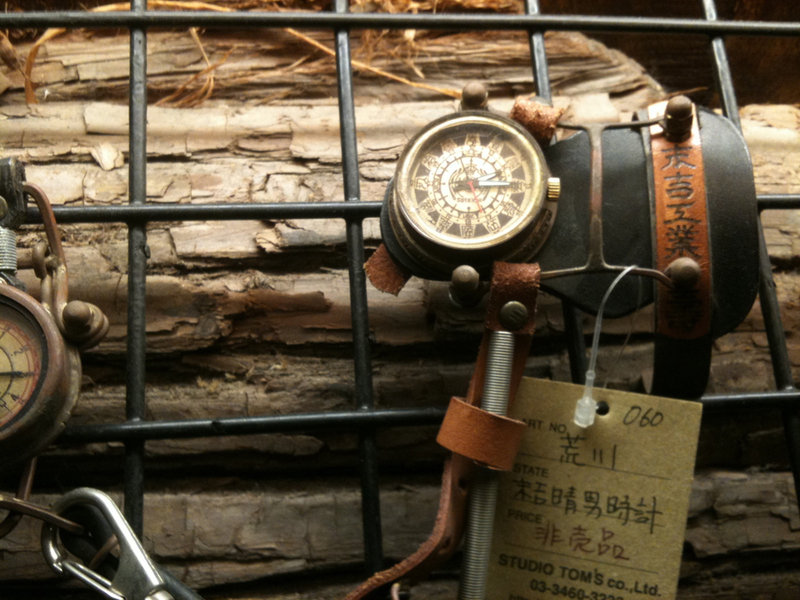 Studio Tom’s is one of the few places that sells watches by legendary Japanese watchmaker Haruo Suekichi. 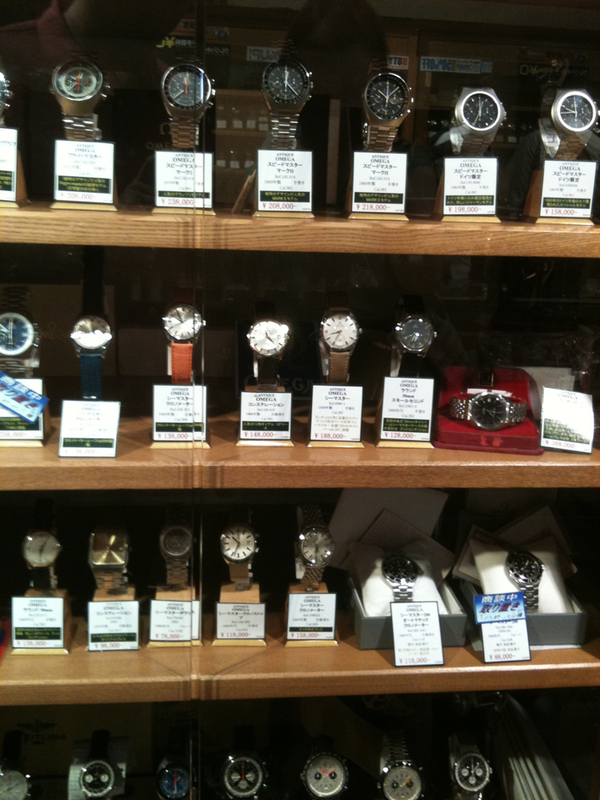 And one of the few places that displays his purchased watches. Customers often leave their watches in the shop during the week, only wearing them at the weekend as part of their cosplay activities. Unfortunately, it was a Friday and the store had been largely cleared of its treasures. But what was left hinted at another world – a lost land of leather and metal. One watch appeared to be part-raygun-part-timekeeper, while another was studded with a temperature and pressure gauge. 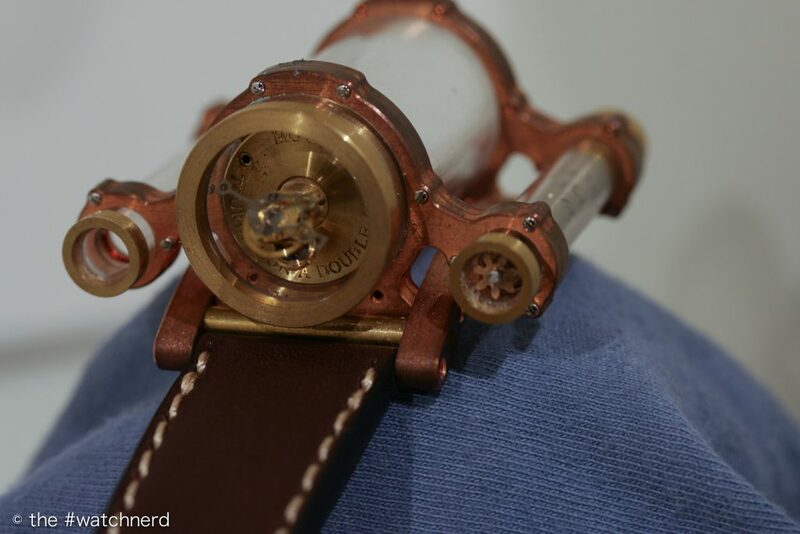 You may have seen Suekichi’s watches at the Museum of the History of Science a few years ago; he predominantly uses basic time-only quartz movements, with hand-painted, stamped or embossed dials and distressed cases. He’s made many thousands over the past decade and although they sell for many hundreds of pounds, there always seems to be a waiting list. His watches are pure aesthetic: leather gauntlets, brass springs or hinges that serve no real purpose, or perhaps a pair of fluttering wings that extend with the flick of the wrist (the wings beat on their own accord, flapping away powered by a hidden battery). This was steampunk, a concept that has probably been around since Verne and Wells. In many ways it’s just Victorian speculative fiction. In others, it’s a lot more. I first stumbled across the genre when I picked up a copy of William Gibson and Bruce Sterling’s The Difference Engine in the nineties. The Difference Engine is often credited with setting out many of the norms of the genre, although the name steampunk was actually a joke by another writer, KW Jeter – a reference to the cyberpunk science fiction of the mid-80s. As an aesthetic (and indeed a lifestyle) the key drivers / pre-cursors include HG Wells’ The Time Machine and Jules Verne’s, 20,000 Leagues Under the Sea. While these novels (and the pictures by Alphonse de Neuville and Édouard Riou) are often credited with influencing many steampunk designs, including watches, it is the Disney version (from 1954) that seems to have had the greatest impact on steampunk more widely. 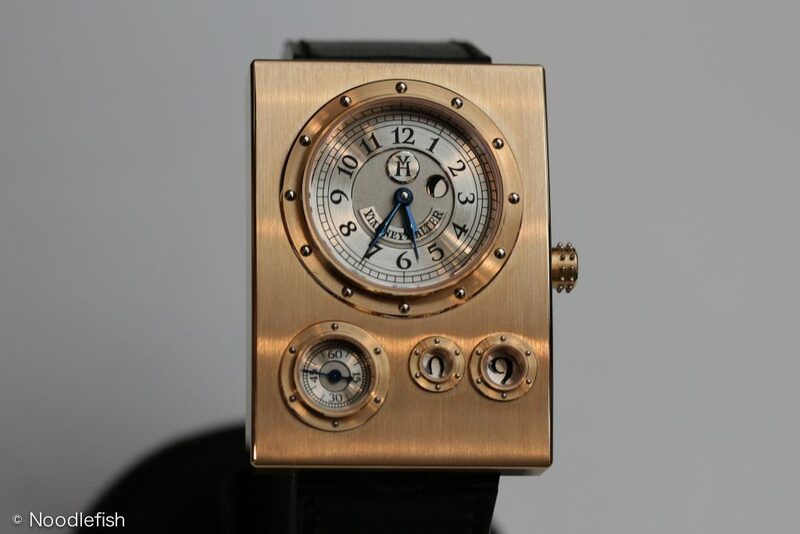 It was the Production Designer, Harper Goff, who wanted the iron-riveted look of Nemo’s submarine – the Nautilus – and there are a number of watchmakers and watch designers who seem to have been inspired by this look. For example, if you were to take a watch designed by Jeff Burns and made by Vianney Halter, divide through by a few rivets and add in a good dose of Clyde Lucas’ 1960 version of The Time Machine, you might get the Trio. Which brings me to Max Busser. The Legacy Machines are watches that he says he would like to have made had he been living in the 19th century (presumably surrounded by all his friends). A gonzo-historic watch, perhaps? The Legacy Machines draw on the designs of Breguet and Antide Janvier – amending the geography of the movement from the rear to the front – and mirroring the resonance or synchronised clocks produced by those great makers. In the latest of these pieces, the LM101, the frosting so often used in English watches, and so famously by Breguet himself, has been incorporated into the dial and movement. 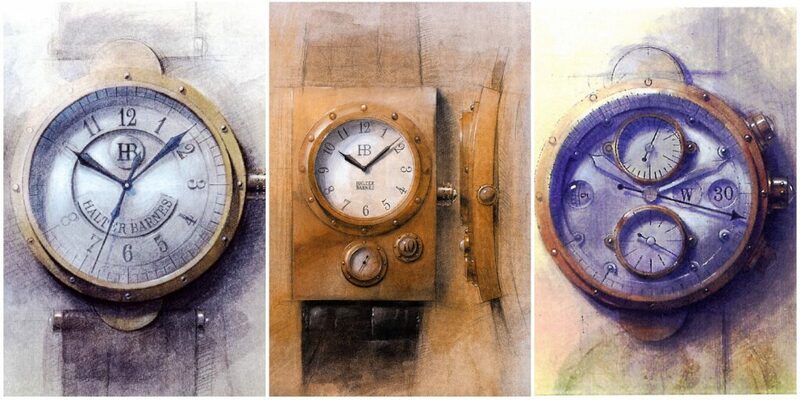 Busser has imagined – or perhaps reimagined – the modern watch from the perspective of the late 19th century. In doing so, and with the help of some of the most interesting watchmakers of the current century, he gives us a reinterpretation of the past. In many ways, these Legacy Machines are (I would argue) the watches most similar to those original steampunk novels. They are watches that are not just influenced by Art Deco, the Eiffel Tower or HG Wells’ Time Machine, but rather a new view of the future – a different timeline – an alternate history. In The Difference Engine, Gibson and Sterling imagine a world in which Babbage completed his automatic calculator in 1825; computers therefore arrive earlier, and technology that would not exist for 150 years is suddenly available. What would such a world look like if we were to apply it to watches and clocks? It seems highly likely that if Babbage had succeeded, the pocket watch would have been largely unaffected – certainly in the short term. Computing power may have led to the development of new complications – although the majority of these had already been created for clocks. Watchmaking hasn’t required complex computing power until recently – but that has been to design new watches rather than to improve them. In many way, Max shares a great deal in common with Vianney Halter. 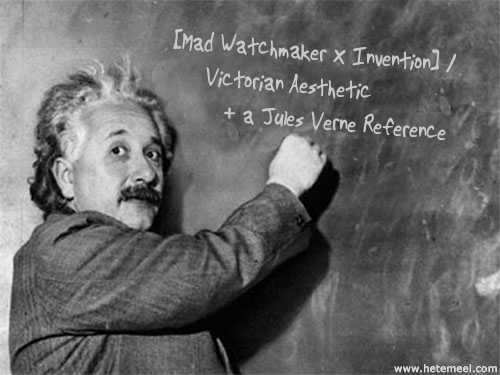 Vianney is, perhaps, the KW Jeter of steampunk watchmaking – the ur-watchmaker. He (along with designer Jeff Barnes) defined the language that others would use – both visually and linguistically. The Halter-Barnes Time Machine Antiqua in 1998, four years before the word “steampunk” was even used on the internet (it appeared on the Boing Boing ‘blog in 2002). It wasn’t even described as “steampunk” – rather Vianney said that it came from another future, a parallel world imagined by those who lived in the 19th century. He calls his designs futur anterieur – past future – and and it brings to mind a kind of retro-futurism in reverse**. The Antiqua’s movement shares the base layout and some gearing with the Lemania calibre 8810. 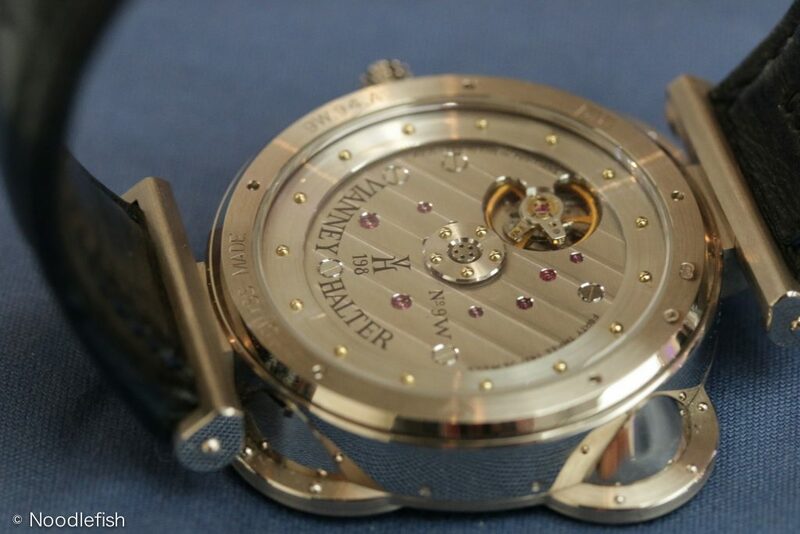 It’s an automatic perpetual calendar with 43 jewels and a so-called mysterious mass winding rotor. This latter item is quite interesting, being built of three separate parts – the central riveted hub, a large sapphire disk and the outer riveted “mass.” Like Thomas Prescher, Vianney likes a bit of theatre. Our preoccupation with steampunk is, perhaps, less of a reaction to the literary genre, nor even the actions of a the cosplayers, but rather a marriage of convenience. 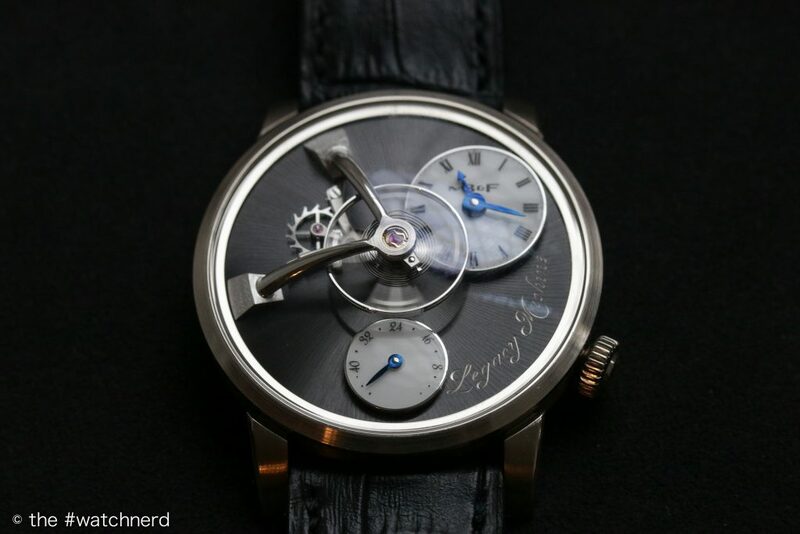 Watchmaking – or rather mechanical watch and clockmaking – is an inherently and increasingly anachronistic endeavour. As Bruce Sterling once said, steampunk is “a counterculture arts and crafts movement in a 21st century guise”. What could be more countercultural than watchmaking?